I'm still alive after all these years (68) and I'm continuing to live my dreams and I'm doing it my way! Retired Former Police Criminal Investigator! Two former wives, three former kids (two former boys & one former girl). It will be fun to mix up the training schedule a bit. Rhett - I feel so blessed even though unworthy to even be in the same room with so many fine accomplished runners. By the time I get started running the Boston 2019 Marathon I will have logged in 24,915 days upon this earth and so many miles that I've lost count, for which I am eternally grateful. So Bro Rhett, it is fun to be able to be changing up my training schedule for yet another run from Hopkinton to the finish line at Boston! 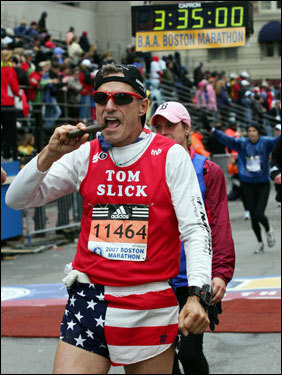 God willing and if the creeks don't rise it will be my 14th running of the Boston Marathon and my 60th lifetime marathon completed! Tom, I am always impressed with the statistics of your running career! Have a great marathon build-up.